President Donald Trump has admitted changing his campaign position on NATO, calling the alliance “no longer obsolete.” His desire for good relations with Russia was seconded by the NATO secretary-general, who said the group does not want another Cold War. Praising the alliance as the “bulwark of international peace and security” that “defeated communism and liberated the captive nations” of Eastern Europe, Trump said he had changed his mind about NATO after it agreed to do more to fight terrorism. “We must not be trapped by the tired thinking… but apply new solutions to face new circumstances,” the US president told reporters in Washington on Wednesday, during a joint press conference with NATO Secretary-General Jens Stoltenberg. “We agreed today that NATO can do more in the fight against international terrorism,” said Stoltenberg, pledging “cash, capabilities and contributions” to the effort. “Together we represent half of the world’s economic and military power. No other superpower has ever had such a strategic advantage,” added Stoltenberg, the former Norwegian prime minister who has presided over the alliance since October 2014. — Donald J. Trump (@realDonaldTrump) 12 апреля 2017 г. Both Trump and Stoltenberg sounded eager for better relations with Russia. US Secretary of State Rex Tillerson is in Moscow, and has met with his counterpart Sergey Lavrov as well as Russian President Vladimir Putin. “Things went pretty well, maybe better than anticipated,” Trump said when asked about Tillerson’s trip, adding that the results should be visible in the long term. Addressing media reports about US officials accusing Russia of complicity in last week’s chemical attack in Syria, Trump allowed for the possibility. Any use of chemical weapons is “unacceptable,” Stoltenberg said. He added that the strike on the Syrian airbase was a US operation, not a NATO one, though it was met with understanding by the alliance. “We strongly support the efforts of a fact-finding commission to establish what happened,” he added. Trump once again described the world as “a mess” that he inherited from the Obama administration, but projected optimism about a range of problems, from Syria to North Korea. “By the time I’m finished, it’s going to be a lot better place to live in, because right now it’s nasty,” he told reporters. 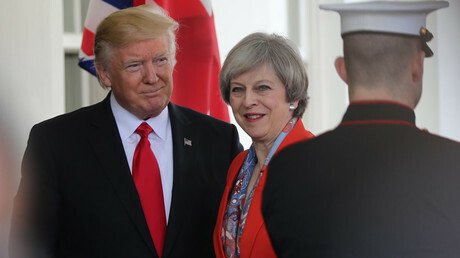 On the campaign trail, Trump repeatedly referred to NATO as “obsolete,” and spoke of the need to update the 68-year-old alliance’s “outdated mission and structure.” He also said that the allies should engage more actively in the anti-terror efforts and not force the US to bear the brunt of the campaign. “We support NATO far more than we should,” Trump said last July, adding that “a lot of countries that aren't doing what they're supposed to be doing.” Because of that, Candidate Trump said that if he were elected, the US would not be strictly held to its Article V provisions to militarily defend any allied nation, especially those not paying their fair share. Trump has repeated many of those same themes as president, as have several high-ranking members of the administration, including Vice President Mike Pence and Defense Secretary James Mattis.